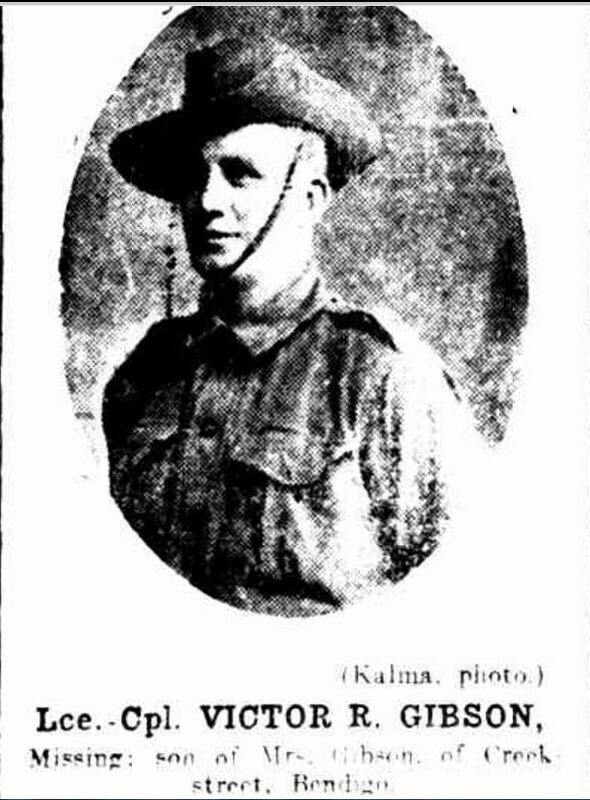 “MISSING SOLDIERS.” Bendigo Advertiser (Vic. : 1855 – 1918) 22 September 1916: http://nla.gov.au/nla.news-article90029589&gt;. 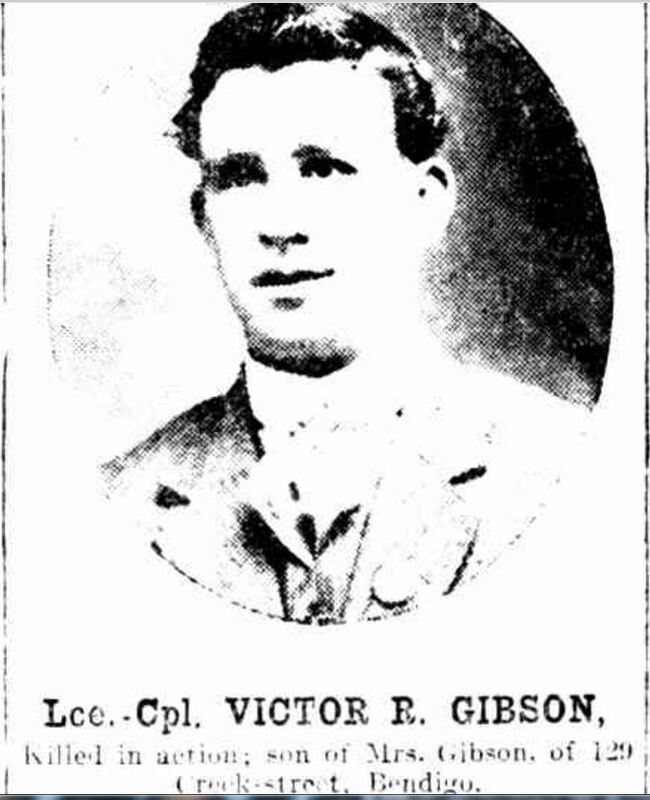 Victor Robert Gibson was a son of pastry cooks, David Gibson and Hannah Osborne and was born in Coleraine in 1893. The family spent time living in Hamilton where Victor’s younger brother Sydney was a student at the elementary school. Around 1907, Hannah claimed that David Gibson had deserted her and the children and did not support them. It may have been around that time she and the children moved to Bendigo. However, David must have been in Bendigo at some point because later, Victor was running is father’s shop, the Hamilton Pie Shop in High Street, Bendigo. In 1913, the Bendigo Council accepted a tender from Victor also a pastry cook, to run a pie stall in Victoria Street for three years and later in the year, he submitted a request to the Rochester Shire Council to run a coffee stall in the main street of Rochester. Only weeks after the declaration of war, Victor enlisted on 14 September 1914, giving his father’s address as Brown’s Butchers in Hamilton. Four days later, Victor’s eighteen-year-old brother Sydney Walter Gibson enlisted and together they sailed with the 8th Battalion on 22 December 1914 for Egypt. 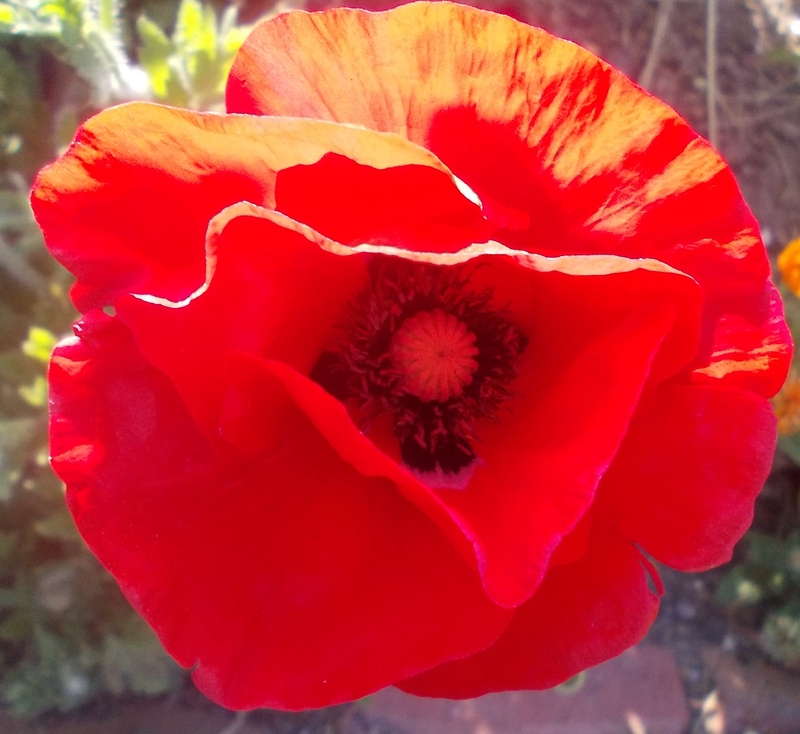 The brothers were together at the landing at Gallipoli on 25 April 1915, however, on 3 May, Sydney was shot in the hip and died in transit to hospital in Alexandria. Victor returned with the 8th Battalion to Egypt in January 1916 and on 24 February, transferred to the 60th Battalion, receiving a promotion to Lance Corporal. He left for France four months later, with the battalion landing at Marseilles on 29 June 1916 and leaving the following day by train for Steenbecque in northern France, arriving on 2 July. By 12 July they were at Rouge de Bout preparing for a planned assault on 17 July. 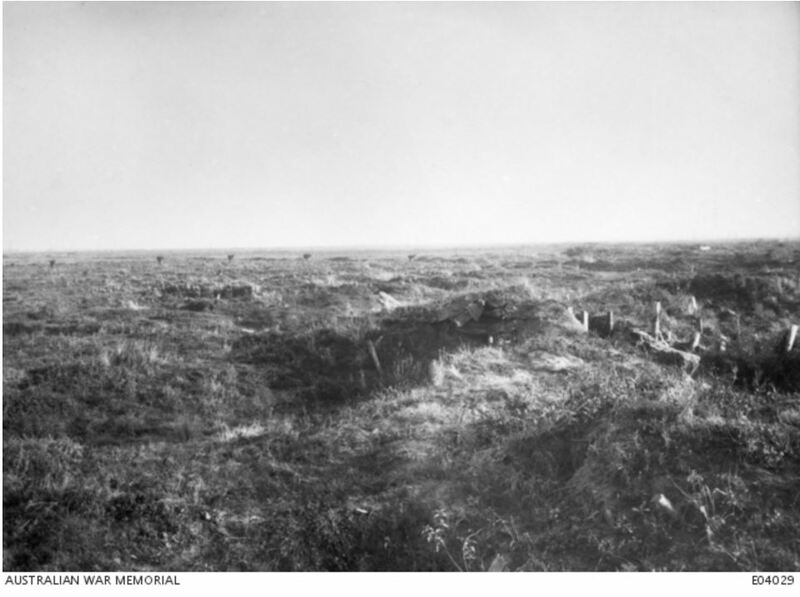 The weather was unfavourable and the assault postponed until 19 July when the 60th Battalion moved into the trenches on the Fromelles front. At around 6:45 pm on 19 July, the first wave of the 60th Battalion scaled the parapets and advanced toward the German trenches. They continued going over until 7:00 pm. As each wave advanced they faced heavy a barrage from enemy machine guns, heavy artillery and rifles. Everything was thrown at them. They only advanced around seventy yards, although it was thought some men made it as far as the enemy trenches. The 60th Battalion was decimated with 757 casualties. Many were missing and one of those was Victor Gibson. It was September before Hannah Gibson had word Victor was missing. With no further news, in April 1917, Hannah wrote to Mary Chomley of the Red Cross and her letter passed to the Defence Department with an investigation held on 4 August 1917. Due to the large losses, few witnesses were available but Carlton’s Edward Haverfield of the 60th Battalion recalled seeing Victor while they lay wounded in No Mans Land near Fleurbaix about 130 yards from their lines. He heard Victor call out he had been hit again. Edward said many wounded men were killed while lying in No Man’s Land waiting for help. As night fell, Edward lost sight of Victor. Hannah did not receive formal confirmation of Victor’s death until late August 1917. While it’s not clear where Victor was first buried, he was exhumed from that spot in 1920 and buried at the Ration Farm Military Cemetery, La Chapelle d’Armentières in 1920. In 1918, a tree was planted for Victor along Hamilton’s Anzac Avenue and his name is on the Hamilton War Memorial. “THOSE WHO HAVE DIED FOR FREEDOM’S CAUSE.” Bendigo Advertiser (Vic. : 1855 – 1918) 3 September 1917: <http://nla.gov.au/nla.news-article90292702&gt;.